October 29, 2011: The Diamond Exchange #3 | Esc.rec. October 29, 23:00-3:00 hrs. 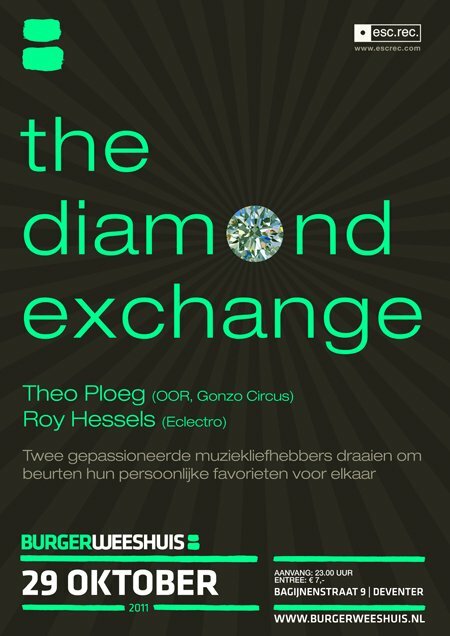 in Het Burgerweeshuis, Deventer: The third edition of The Diamond Exchange, with Theo Ploeg and Roy Hessels. Theo Ploeg is journalist/reviewer for a.o. OOR and Gonzo Circus. But that’s not all… read an impressive list of his (past) activities overhere. Roy Hessels is chief editor of Eclectro.nl and a musician himself. Could be a very interesting match again. Also because they’ve never actually met… exciting! You have to pay 7 euro to get in, but then you also get to enjoy Deventer Dub Sessions with Trus’me en Ferdi Blankena & Sense Unique. UPDATE: Theo Ploeg can’t make it. He’s ill. Luckily I could find a worthy replacement on this short notice: Michael Rhebergen (Mical Rhebess).